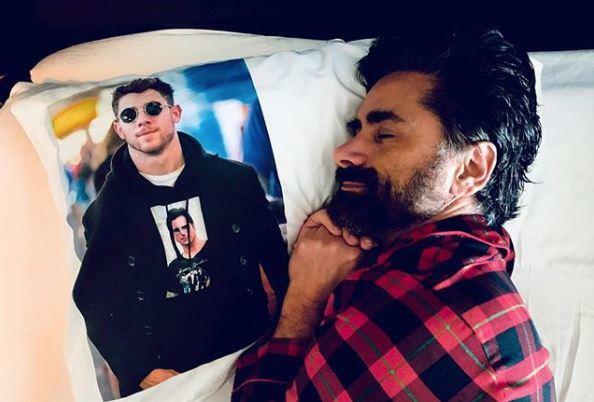 Nick Jonas and John Stamos Keep One-Upping Each Other in a "Bromance War"
It started with a photo of John Stamos rocking a Jonas Brothers t-shirt and snowballed into the most wholesome prank war slash bromance ever. There's something undeniably special about friends who are so close that, even at your worst, you have an amazing time with them. Movies celebrate these friendships, there's TV shows and songs about them, too. We all want that very special friend in our own lives that just get us man, you know? People love these bromances and womances so much that they gobble up pretty much any story about an unlikely or unexpected friendship. 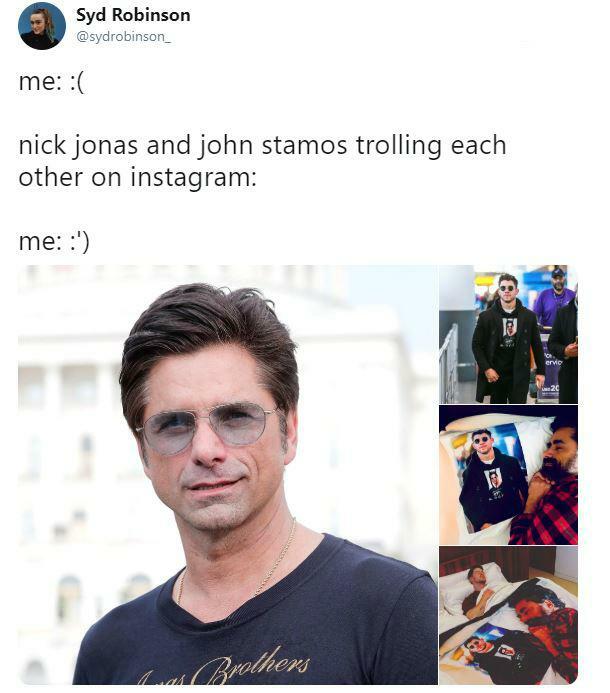 That might be why so many people are going nuts over Stamos and Nick Jonas gassing each other up on social media in a series of fawning photos expressing their mutual adoration in increasingly affectionate ways. 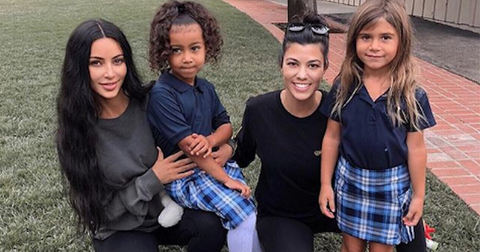 It's a wholesome display of appreciation and one-upmanship. And it all started with this photo of John Stamos rocking an old-school Jonas Brothers shirt. He must've donned it after learning the Jonas Brothers are getting back together. It didn't get long for Jonas Brothers fan accounts to post the picture, because there's probably no better vote of confidence than Uncle Jesse's, am I right? On more than one occasion, our boy Stamos was repped the Jo-Bros. Grateful for the love, Nick stepped up and paid homage to Stamos by getting his own t-shirt printed with a photo of John wearing the t-shirt. The Inception style-nod is the ultimate example of real recognizing real. 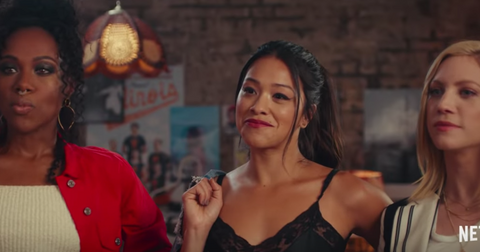 I mean, I don't really get the connection between these two guys, but they do have some things in common: they both have full heads of nice black hair, and they're both musicians. Remember Uncle Jesse's rendition of "Kokomo?" I do, and I thought it was the height of television when I was a kid. Nick made it very clear in his Instagram post that the pic was a challenge to his bro. "It's your move @johnstamos. #jonasbrothers #sucker," he wrote in the caption. John raised the stakes, posting this beauty on his Instagram page. Look at his smile. Look at the bliss. The little touches in Stamos's post are just brilliant. Firstly, he tagged his location as "Heaven" and then captioned the photo with, "I had the craziest dream last night..."
Nick, not one to back down, upped the ante, in keeping with the "anything you can do I can do better" theme. 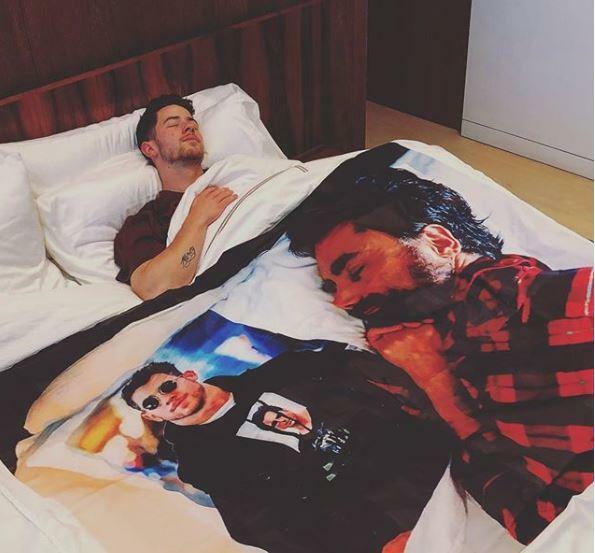 So what we've got here is a photo of Nick Jonas in bed, sleeping beneath a blanket of John Stamos, who is sleeping beside a pillow printed with a photo of Nick Jonas wearing a t-shirt that has a photo of John Stamos wearing a t-shirt of the Jonas Brothers. I mean where do you go from there? 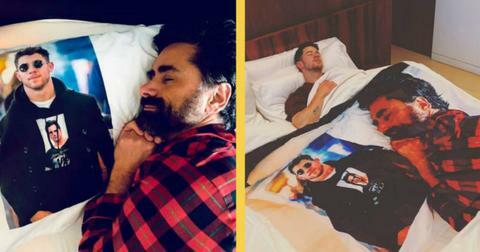 Do you get an entire bedroom set filled with Jonas Brothers memorabilia? Do you wrap your car in a Jonas Brothers design? Stamos had to up the ante, and up the ante he did. Yes, it appears John Stamos got a tattoo of Nick Jonas on his arm. I think the only thing for Nick to do is get an entire back tattoo of Stamos' face. Now it's unclear whether that's a temporary tattoo or Photoshop or if John not the real deal, but it sure looks pretty convincing. 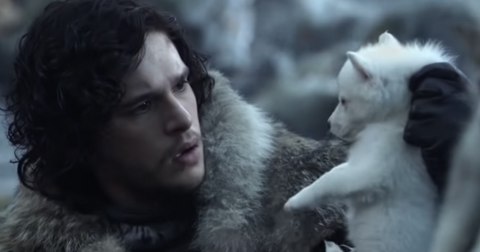 Regardless of whether it's genuine, tons of fans are stoked to see this wholesome back-and-forth love expression. Celebrity bromances aren't a new thing, either. 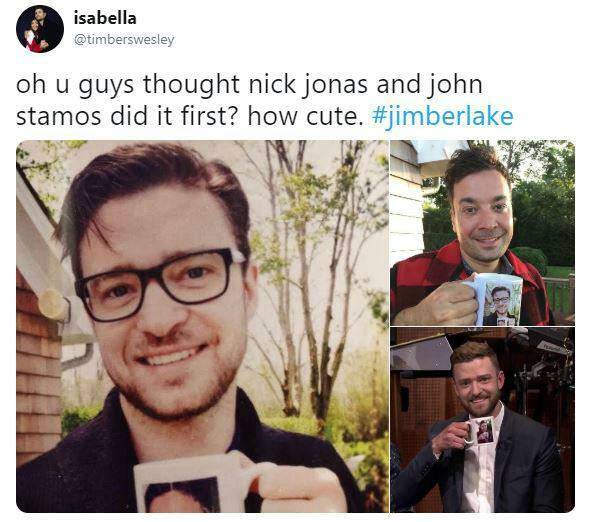 People who were following the wonderful back-and-forth between Nick and John recalled the Justin/Jimmy mugception war. 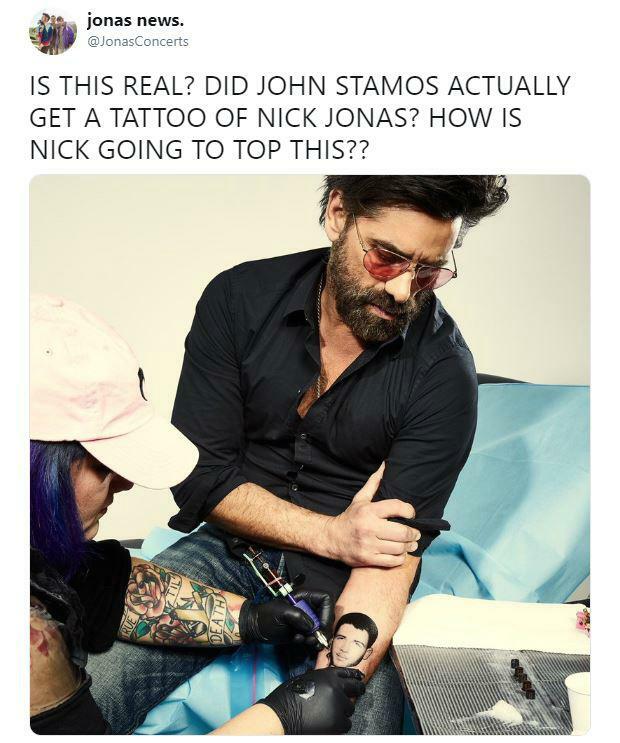 As of now, Nick hasn't responded to the tattoo post by John Stamos, but I don't think this is the last we'll hear from him. If a man is capable of having 49 different wedding receptions, I'm pretty sure he's dedicated enough to see this prank war to the very end. The Jonas Brothers Are Reuniting — But Why Did They Break Up in the First Place?